Custom vinyl stickers on stairs. 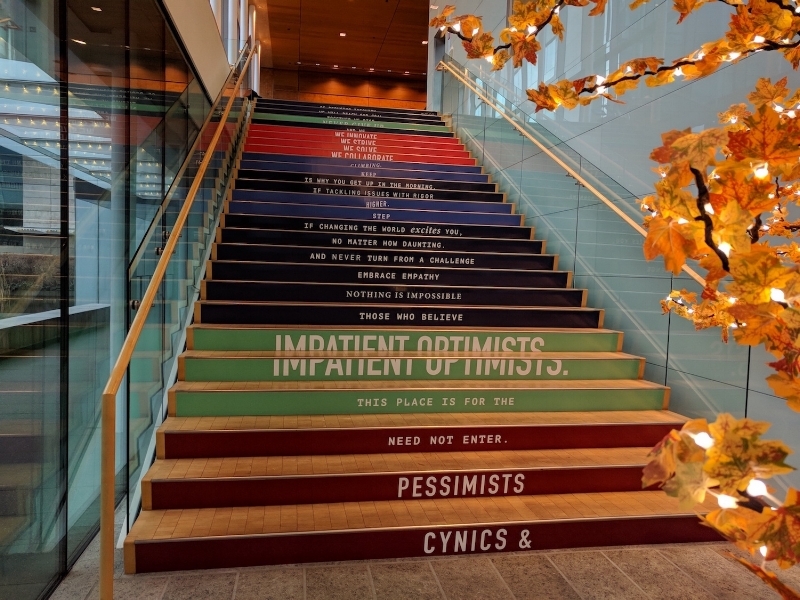 Produced and installed in September 2018 for Bill & Melinda Gates Foundation. Custom Sandblasted Cedar Exterior Sign. Engineering Services, Permitting, Production and Installation. Aug 2018 for Sand Point Grill in Seattle area. Large wall mural. 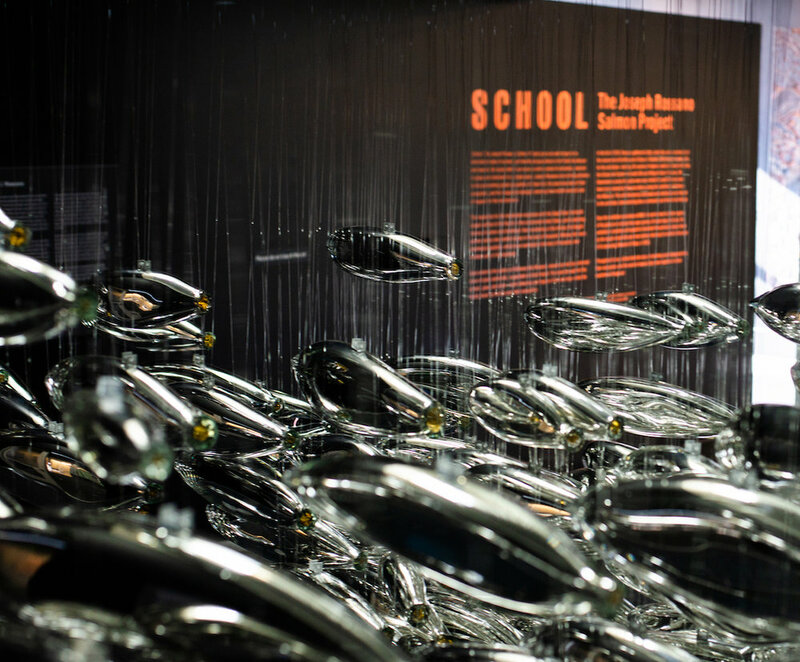 Produced and installed in May 2018 for Bill & Melinda Gates Foundation and Digital Kitchen. Custom vinyl stickers on stairs. Produced and installed in December 2017 for Bill & Melinda Gates Foundation. Boat name and hailing port premium vinyl lettering produced and installed in July 2017. South Lake Union Area. Interior LED sign production and installation for By The Pound Deli - new business in Capitol Hill, Seattle, December 2017. 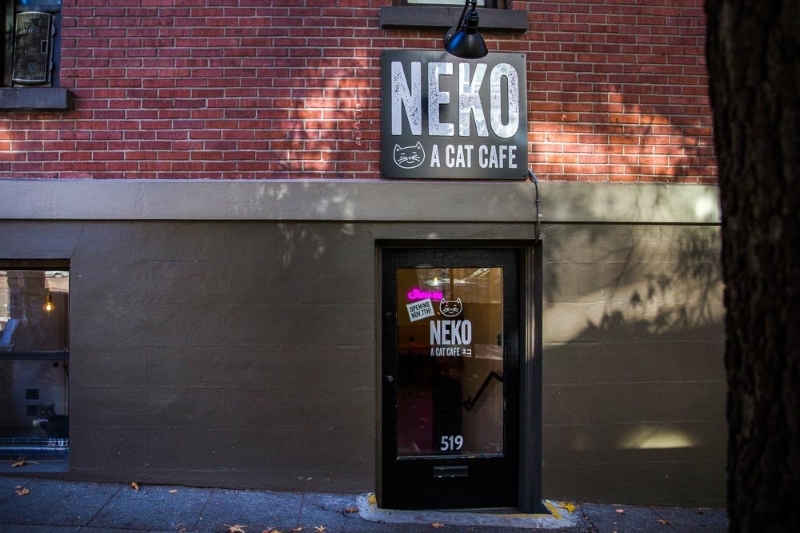 Outdoor Custom Sign for Neko Cat Cafe - new business in Capitol Hill, Seattle. Produced and installed in September 2017. Large metal dimensional sign for Harris Bricken. Produced and installed in April 13 2018. Our sign company is a place where you can get beautifully designed and unique business signs or banners to meet your company’s needs. We offer affordable prices and we have signs in a variety of sizes. With over ten years of experience, we have the expertise needed to assist you in choosing the best signs. We realize that signs are often the face of a company, and this is why we take pride in creating high quality signs. We started our store with the goal of assisting friends who needed signs for their shops. This clientele list then expanded to other business owners in the Seattle area and we have been successful ever since. When we first meet with the clients, we find out their goals for the signs and then we devise a design plan that will best fit those goals. We delight in being able to create well-constructed signs for our customers. Signs boost a company’s sales in various ways. Aside from the branding benefits for your company, having a sign is excellent for promoting certain discounts. Many customers take advantage of bargains after seeing signs in the window or on a billboard. 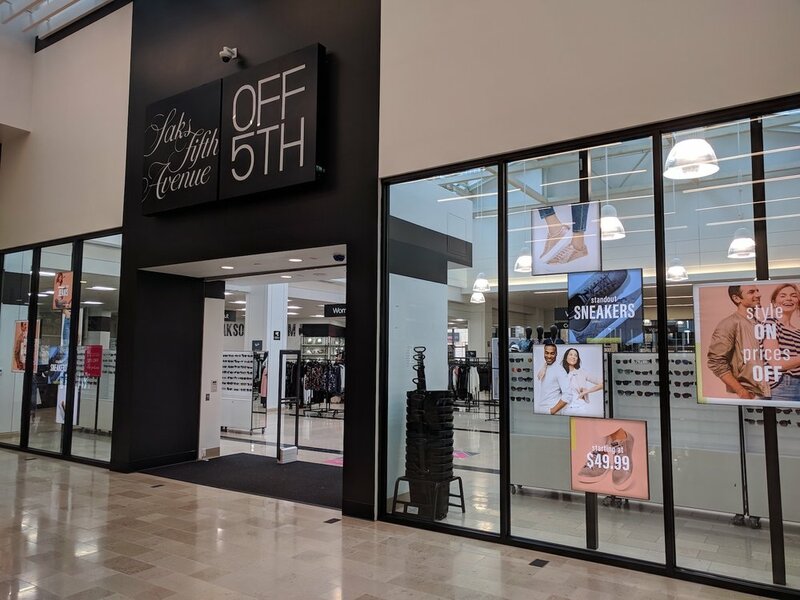 If your store’s signs contain bold colors, catchy slogans and unique lettering, your business will get the right attention. We can increase exposure and revenue for you. The signs that we create for your company can also be a part of mobile advertising. This is because your potential customers will be able to take photos of your sign on their phones and send them to the addresses of friends and loved ones. And if your company offers QR codes to customers, they can scan your sign to find out the latest deals. Our variety is also what makes us stand out from the competition. Our sign company offers aluminum signs, blade signs, wooden signs, plastic signs and vehicle wraps, which are becoming an increasingly popular way to advertise businesses. Our lettering options include channel lettering, vinyl lettering and banners. Using Banners is a good way to celebrate special occasions such as weddings, anniversaries, graduations and retirement parties. Our sign company offers a wide variety of banners in diverse colours, fonts and sizes. The banners range from small to large and we can use the lettering of your choice. We can suggest which types of signs might work the best for your business. If you own a hardware store, thrift store or flea market, garden supplies store, bakery or antique shop, a wooden sign would work for these businesses. But if you own a clothing store, trendy restaurant, record store or computer store, it might be a good idea to use a neon sign or a sign with vinyl lettering. Our sign company believes in matching the right kind of signage with the type of services you offer. If you need weatherproof sign, we have that option for you. This means that if you will hang up your sign outdoors, the signs can withstand various types of weather such as extreme heat or severe thunderstorms. Although a majority of our customers use signs to place in front of their businesses, some of them purchase signs to use to advertise at trade shows. At trade shows it is important that you put out a large and visible sign to attract visitors. Our sign company can make your trade show appearance a success with our diverse options. Not all signs have permanent purposes. We offer temporary signs that you can use for garage sales, clearance sales at your store, book signings, and giveaways during the holiday season. These signs are easy to take down after use and you can reuse them throughout the year. Seattle SignShop also offers on-the-go advertising. For example, we have van decals, car magnetic signs that do an excellent job of advertising your business in a simple way. We also offer taxi decals, vinyl cut letters and car door lettering. If you are looking for a more creative and unique way to advertise your business using signage, our hand-painted signs would look fantastic. Our staff takes special care in creating these signs and you can be sure that your hand-painted signs look professional and exciting to potential customers. Seattle Sign Shop has a team of talented graphic designers and they can offer a variety of images, fonts, and font sizes that best suit your needs and preferences. If you are interested in huge signs with fancy ancient-style lettering, our company can provide it for you. If you want a few small signs with mostly images, we can create the perfect sign for you. We will also ensure that the sign we create is in line with your concept. We will not do anything that takes away from what your company’s mission is. You tell us exactly what kind of image you want and we will come up with the right design for your needs. Even if we make suggestions, we will make sure that these ideas are in line with your marketing goals. This makes for a beneficial professional relationship. We believe in giving you the product in a timely manner, but we also believe that the most important thing is the quality of our work. We pay special attention to details and we will only be satisfied when our customers are happy. Our company is more than just a place that sells signs and banners. We like to think of yourselves as an extension of your company’s marketing strategy. We are collaborating with you to give your company the exposure it needs so that you will succeed long term. Want to get a quote for your business sign quick? If you’re new to ordering sign services for your business, don’t worry. We will use our expertise to assist you in figuring out which designs, images and fonts would work the best for you. You don’t have to feel intimidated by the process because we are here to simplify the process for you. With our help you will have the best display of your services. Give us a call at (206) 659-5290 from 8AM to 6PM M-F for a free estimate and consultation for any signs in Seattle metro area.